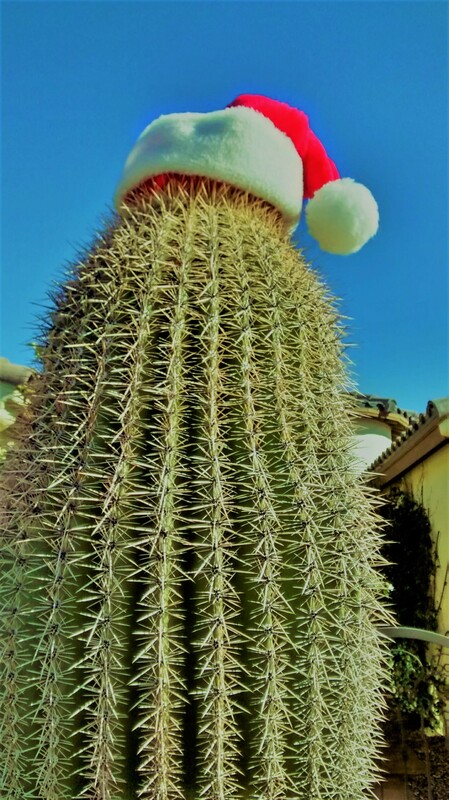 The cactus in my daughter’s front yard joins the holiday celebration. Litchfield Park, AZ, Dec. 2016. The winters here in the Sonoran Desert aren’t anything like the icy, snowy, overcast winters I experienced for most of my life in the Northeast U.S. But there are clues to remind us southern Arizonans which season we’re in: the daytime temperatures gradually change from sweltering 100 degrees to a springlike 60-70 degrees, cacti in front yards suddenly sport Santa hats, strings of colorful lights outline an increasing number of houses and, of course, the stores are in full commercial steam as they tout their holiday wares. Many of us, particularly retirees, have relocated to the Phoenix area to escape the inclement weather of northern winters. The closest we come to snow here is when trucks bring in piles of the clean, white, fluffy stuff from the high country, usually Flagstaff, for snow-deprived Phoenix-area children to play in. But I’ll admit that I miss at least one good Western Pennsylvania-style covering of snow during the holiday season. The following story by Judy Caldwell Nelson, formerly from Sharpsville and now living in Washington State, can make anyone nostalgic for such a snowfall. Behind Ste wart’s, the grocery store on the corner of 7th Street and Ridge Avenue was a vacant area with trees and bushes and a small creek running through it. One winter during a spectacular snowfall, I was out walking in the evening snow bundled in a snowsuit and galoshes. I was probably between eight and ten years old at the time. As I walked up Ridge Avenue, I turned my head to look at the lot behind the store. The bushes and stunted trees, like everything else, were clothed in overcoats of white. I walked into the area. The rocks in the stream had pillows of snow on them and the creek trickled around them on its way to some unknown destination. The dim streetlight on the corner reflected off the trees. The stream ripples reflected the light. I breathed in the brisk, clean air smell that always accompanies a snowfall. Blue shadows outlined the mounded snow drifts in the open areas between the trees. Each tree branch and twig was outlined in white. And everything sparkled. Huge snowflakes were silently falling all around me, and I felt alone in a place of great beauty. I didn’t want to leave the moment. I wanted to wrap up my feelings and the beauty and save it forever. I’ve always wondered at the fact that snowflakes fall so silently. It seems that all those swirling, falling and drifting flakes should somehow cause a small faint tinkling sound – just as stars ought to have a few faint heavenly notes accompanying their nightly appearance in the sky. Now the vacant lot has been filled in and paved over to create a parking area for store patrons. In the song, “Big Yellow Taxi,” Joni Mitchell described a “paradise” that was paved over for a parking lot. Those lyrics perfectly described my sadness at the loss of this beautiful bit of nature. — Judy Caldwell Nelson (SHS 1958), Shoreline, WA, March 2013. 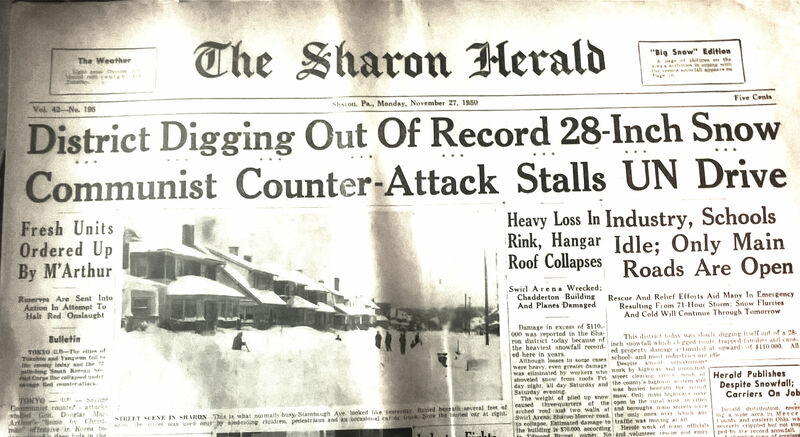 The current winter weather woes of the northeast U.S. had me thinking of a particularly snowy event in my past that was so cold, so windy, so widespread, so destructive, and resulted in snow so deep that it has been named the “Storm of the Century.” It seemed a good time to record memories of the Big Snow of 1950. Anyone from the Sharpsville area knows about snow, ice, sleet, slush, and drizzle. 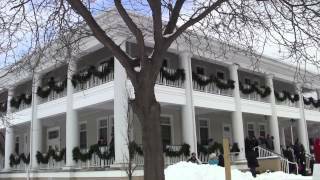 Sharpsville gets an average of 55 inches of snow per year, according to www.usa.com. The State of Pennsylvania’s average is close to 36 inches and the average in the U.S. is 23.27 inches. Sharpsville’s cold and snowy winters are often made worse by the town’s location approximately 50 miles south of Lake Erie. When the arctic winds blow across Lake Erie’s relatively warmer waters, they pick up moisture and then dump it as snow in the higher elevations downwind from the lake. This lake-effect can sometimes extend into Mercer County. 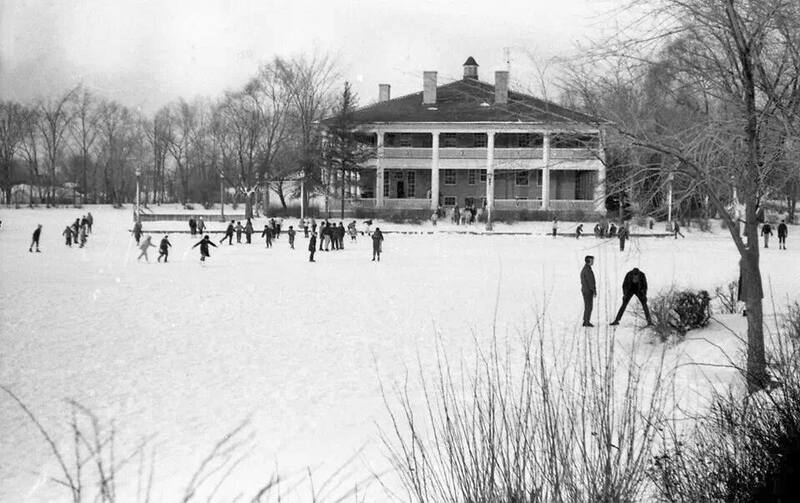 Besides the annual experience of numb fingers and toes as kids, icy weather meant a precarious trek up South Second Street hill each weekday to attend high school, when it seemed that we slid back two steps for every step forward. The street itself was often deep in snow, creating a slippery slope that tempted neighborhood boys to try out their sleds. The ride must have been exhilarating as the daring sledder raced down that steep hill, across Main Street, down North Second Street, and finally coming to a stop at the railroad embankment. The Big Snow, also known as The Great Appalachian Storm, began Wednesday night and fell all day Thursday and Friday until it was approximately 32” deep. My brother Mike and I put on our snow pants, coats, hats, and mittens, eager to experience such a heavy snow firsthand. But first, we had to push hard on the front door, blocked as it was by so many feet of snow. Once outside, we dug our way as far as we could manage, creating walls as tall as we were on each side of our path. [My brother and his wife] were at the farm for a 1950 Thanksgiving weekend. Weather predictions were for snow, so my brother decided to return to Cleveland early to avoid getting caught up in it. But it was too late – snow began falling even as they prepared to leave Wheatland. There was no trouble getting to Sharon to catch the bus for Cleveland, but the snowflakes were so large and fluffy and falling so fast that, before the bus arrived in Warren, Ohio, travel became slow and hazardous… Normal travel time of the last leg of the trip would have been an hour – but only after 8 to 10 hours later did [they] arrive home, after a harrowing travel experience. On Friday morning after the snowfall ended, a bright sun was shining, despite the crisp, sub-freezing temperature. Early commentators on the local radio station, the weatherman, and distant news media reported a virtual shutdown of all street and road traffic, with a message that all should remain home. The entire area of northeast Ohio and northwest Pennsylvania, from Columbus to Pittsburgh, was under a snow-bound alert, and it could be a day or two before snowplows would make roads passable. That Friday morning I was up early to go to work. I trudged my way to the railroad roundhouse two blocks distant and boarded the Pittsburgh-Sharon passenger train that was being coaled up for the daily trip. It started each morning in Sharon and returned that evening from Pittsburgh. Due to the snow, the short ride out of Wheatland took a bit longer in time. The conductor remarked that, in all his years, he had never experienced so much snow. 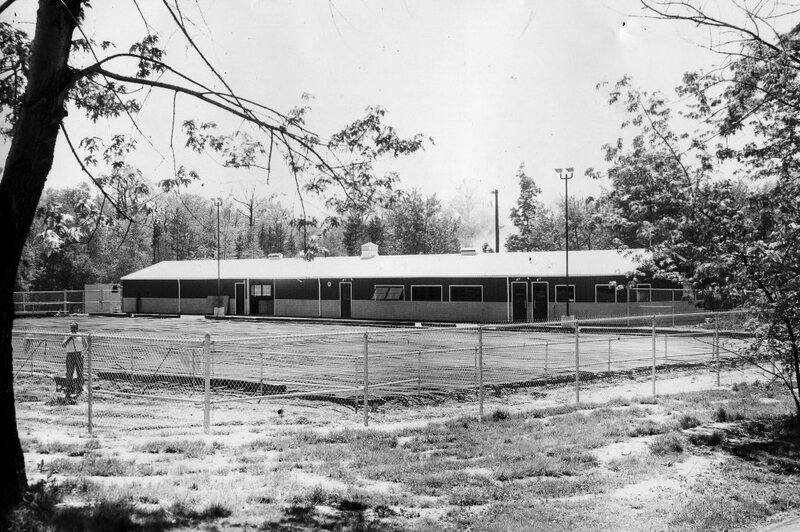 I arrived at The Sharon Herald newspaper plant and was welcomed by a surprised composing room foreman, a front office manager, and the night watchman – the only people in the plant…. I worked all day Friday, then waited for the train to arrive from Pittsburgh and backtrack to the roundhouse for its next day’s trip. Listed by some websites as one of the top ten blizzards of the twentieth century, this was indeed a storm to remember. If you, too, were around during this climatic event, please share your memories with us.